Love happens best when you keep it simple, so keep your look - spotless and radiant by following a few tips as you prep for your date. No need to dig through your vanity bag or fast your body till you drain out. Whether you’re dodging cupid arrows or pumped in red to woo your date, Ponds White beauty BB+ fairness cream has got you covered, this Valentine’s Day. Movie dates, delicious dinners, or a sunny brunch at the bay, follow these simple rules to get that natural spotless toned-down look. The Fantastic Foods – A great natural look starts with great skin. The first thing that impacts your physical health is your diet. So don’t run-away from food, The Cocoa Shield: For the chocoholics, dark chocolate, is a great antioxidant and can do wonders to your skin. It contains flavonoids that protect your skin from harmful UV rays. So turn the glow by indulging into chocolates for this month. Vitamin ‘Edgy’: Spinach, rich in Vitamin E surely did the needful for Popeye in enticing Olive Oyl. Vitamin E is seen as a wonder nutrient. Skin whitening, acne treatment are few of the many benefits of the big ‘E’. The Road Runner–Workouts don’t have to be about dropping pounds or gaining some, regular workout is essential to keep your body nourished at all times. Further, exercises such as running increase the blood circulation which not only nourishes your skin but also makes it look radiant If you’re not much of a runner, try fun workouts such as Zumba, Kick-boxing, yoga, anything that makes you sweat out. Study reveals that regular workout helps build your immunity and also make you more confident. So add that regal touch to your date by bringing out the strong, confident person in you. The Instant Spot-less Look – As important as it is to look good, you must remember that being natural is always appreciated. Don’t stress your skin with several layers of makeup. Instead use an all in one BB+ cream that instantly covers spots as well as gives you an instant radiant finish. It also works on the inside to lighten skin.Ponds white beauty BB+fairness cream combines vitamins along with GenWhite formula that is perfect for a natural looking spotless radiant look all day. With the Pond’s Institute’s dual-acting sophisticated skin lightening GenWhite™ cover formula and SPF 30 PA++ advanced sunscreen protection, Pond’s White Beauty™ BB+ fairness cream not only improves skin texture and effectively lightens skin from within but also provides natural looking instant glow for your skin.Love the skin you’re in this Valentine’s Day with these easy tips and get beautifully spotless radiant skin come February 14. The Pond’s white beauty portfolio combines the dual benefit of instant coverage of spots as well as lightening skin within to help reveal perfect natural look. 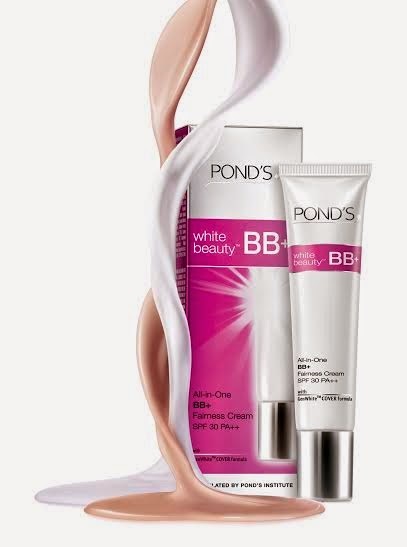 Pond’s white beauty™ BB+ fairness cream with SPF 30 PA++ and GenWhite TM cover formula provides natural coverage suited for Indian skin that conceals spot instantly while working from deep within epidermis to lighten stubborn spots for all day instant spot-less radiant skin. 1 Cleanse your face with Pond's white beauty face wash, squeeze a small amount of Pond's BB+ cream on your fingertips. 2 Dot your forehead, cheeks and chin. 3 Blend and spread outward toward the hairline and jaw line for an even coverage. I have to be honest, I prefer to not use white beauty products.